Woodpeckers are ecologically extremely beneficial for the arboreal environment. Forested areas as well as individual trees in urban and suburban locations are kept healthy by the work of the Picidae family; without them, trees would suffer mass infestations of insects. As the birds forage, they generally excavate diseased, dying, and rotting trees. Anything is subject to the Woodpecker’s search—trees, utility poles, houses—as it forages for food. They will fly from tree to tree in an undulating pattern, creating rows of drilled holes which range from the tiniest openings to deep cavities. The crevices in the bark allow them to excavate the wood and discover insect nests and grubs. They also bore into the underside of split-rail fencing to reach the wood bees and their larvae. The diet consists predominantly of insects and grubs found in both living and dead trees and shrubs. Their diet includes other arthropods, fruits, nuts (particularly acorns), seeds, flower nectar, sap, berries, bird eggs and lizards. They will even open beehives in order to get to the honey! As they forage, their hammering enables them to access wood-boring grubs, beetles, ants, termites, spiders, and caterpillars. Other Woodpecker favorites include peanut butter and a wide variety of suet cakes. (Gelatin-based cakes are better for both Woodpeckers and other birds than fat-based suet in the summer. The fat-based suet will adhere to the breast feathers, and when the birds return to the nest, the parents will transfer the suet to the chicks, creating mold and bacterial disease. On both the chicks and the adults, the suet will turn rancid and cause illness in the birds.) Woodpeckers are quite flexible, omnivorous and opportunistic in their search for food. They will even frequent Hummingbird feeders! A glue-like substance produced on the tip of the tongue enables this bird to catch and withdraw insects. The long, protrusible tongue is supported by an exceptionally long hyoid bone. The hyoid bone, which is at the back of the tongue, is common in animals, but in the Woodpecker, it acts as a “safety belt” for the head. The hyoid bone is attached to muscles that enable them to dart their tongues in and out with great rapidity. This bone extends around the back of the skull, then over to the base of the bill. It may circle the right orbit or go to the end of the hollow inside the upper mandible. The Woodpecker is actually able to hear the insects crawling under the bark! He then excavates by hammering a hole into the wood. His long, barbed, sticky tongue extracts the prey; the tongues sharp texture allows him to probe for the bugs, and its sticky saliva attaches to the prey. The shape and function of the tongue vary among species. 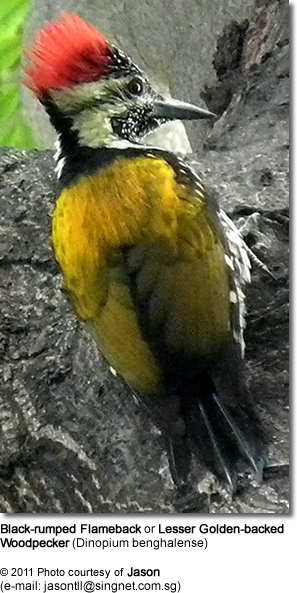 It is determined by the bird’s diet and foraging techniques. Those which excavate deep into trees, such as the Pileated, have shorter tongues, with spear-like tips, which bear backward-facing barbs. Ground foragers, for example the Northern Flicker, have tongues with flattened tips. The tongues of Sapsuckers brush across the sap and hold it by capillary action. Those species that forage mostly on the surfaces of trees, working at the crevices and bark, usually have longer tongues with thick bristles bundled at the tip of the tongue. When Woodpeckers forage, it is often alongside other birds in a mixed-species flock; however, most of the time they tend to feed on the outer edges of the flock. Merging with these flocks of other insectivorous birds allows them to consume more food since they need not be so guarded against predators.